For as deliciously rewarding as canning your own fruits and vegetables can be, the actual canning process isn't all candied rainbows and Martha Stewart smiles; it involves a fair amount of hard work. But why should you do the heavy lifting when this new automated canning system from Ball can do it for you? It's an automated home canning system that sterilizes and preheats the jars as well as processes them once they're packed. Basically, it's the rice cooker of home canning. Because the traditional canning process is a chore. You've got to keep a gigantic 15 gallon pot of water boiling continuously for hours on end, ensure that your cookware is completely sterile, and maintain meticulous timing lest you over/under process a batch. And even then there's no guarantee that everything will go smoothly. The auto-canner handles all of these tasks for you, while requiring a fraction of the water. Made of stainless steel with a locking plastic lid, it stands about two feet tall and a bit over a foot in diameter. The front of the unit is adorned with a touchscreen control pad under a large, easy-to-read LED display. The auto-canner's interior consists of a removable canister seated atop the heating unit. Great googly-moogly, this is easy. Fill the inner canister with six cups of water—-seriously, that's it—drop the included rack into the bottom of the canister, followed by the jars you'll be using. The canner will sterilize and preheat them (so they don't shatter when you pour in boiling hot liquids) in about 12 minutes. Once you've filled the jars with whatever you're preserving—presuming you're following the included recipe guide—place the jars back in the unit, select a processing program as dictated by the included recipe guide, and wait for the unit to do its magic. 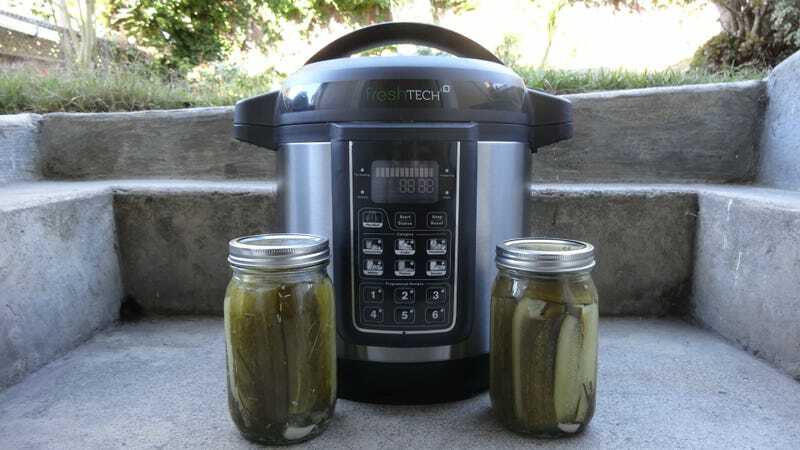 While it takes 35 minutes to process pickles whether you do so on the stovetop or in the auto-canner, the FreshTech doesn't demand you constantly keep an eye on it, giving you time to set up the next batch of jars. The Freshtech can hold up to 6 half-pint, four pints, or three quart jars per processing session. Six cups of water. Literally six cups of water is all you need for the entire canning process. That's insane. And since you aren't trying to boil a cauldron's-worth of liquid you don't need a full oven range. As long as you have a 110V outlet and some counter space, even micro-apartment dwellers can enjoy the hobby. Plus, it's sized for small batch production so you won't have to keep huge stores of jars and vegetative precursor. 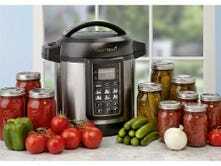 But more than anything, the auto-canner is great simply because it handles all the work that makes home canning a pain. The system is definitely geared more towards the neophyte canner than seasoned veterans, and demands that you follow the 50-odd canning recipes in the included manual. It's not a huge deal, you can easily modify their recipes to suit your own taste but having a manual input mode where you could dictate a specific processing time would have been really helpful. There's no recipe for making green beans or dilly beans in the manual, for instance. I know how long I need to process them, but since the controls only work by product class (Jams and Jellies, Salsa, Pickles, Fruits, and Sauces) with one of six pre-set programs, I can't. Plus the $300 price tag is definitely more than you'd spend on a Granite Ware pot and the necessary canning tools, but it will quickly make up for the initial monetary outlay by using 60 percent less power and 85 percent less water. Heck yes you should. Even with its instructional limitations, the FreshTech auto-canner is an order of magnitude easier than the traditional method. Get one at William Sonoma or online at Fresh Preserving Store or Amazon.